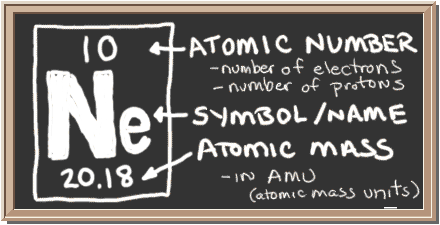 So... for the element of NEON, you already know that the atomic number tells you the number of electrons. That means there are 10 electrons in a neon atom. 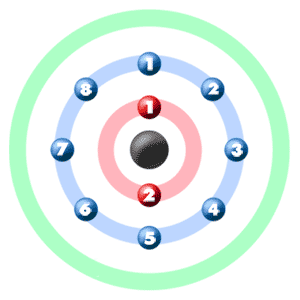 Looking at the picture, you can see there are two electrons in shell one and eight in shell two. Because shell two has eight electrons it is now full. ► More about the history and places to find neon. Hey! 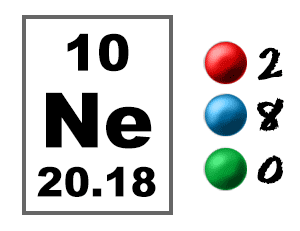 Neon (Ne) is the second of the noble gases. Just like all noble gases, it is very non-reactive. So much so, that it doesn't form compounds with anything. Just like helium (He) and argon (Ar), neon floats around all by itself. It is non-reactive because it's shells are full. Because neon has two atomic shells, it needs two electrons in the first and eight to fill the second. Neon has a total of ten electrons which means two filled shells.